Promise a Lot...Deliver Even More. Environmental Corporation of America (ECA) is an environmental, ecological, geotechnical, and cultural resources consulting firm serving public and private sector clients throughout the United States. Founded in 1989, ECA has successfully completed thousands of environmental, geotechnical, and cultural resource projects. ECA strives to enforce clients’ standards, to protect and enhance their reputations, and to contribute positively and identifiably to their successes. 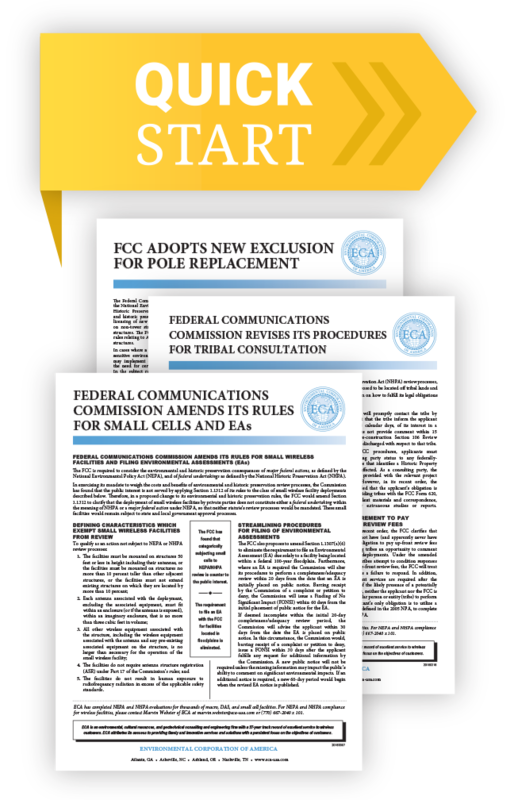 FCC Adopts New Exclusion for Pole Replacement In the subject ruling, the Commission has crafted a categorical exclusion for replacement poles. We are an environmental, ecological, geotechnical, and cultural resources consulting firm. We serve public and private sector clients in a variety of commercial and industrial sectors.